55.9% of 25,000 young people believe their views are being ignored when important decisions are made. Young people feel that they’re not being listened to by global decision makers. But with over half of the world’s population under the age of 30, it won’t be long before they will be making their voices heard. Almost 25,000 people aged between 18 and 35 from 186 countries and territories took part in the Global Shapers Annual Survey 2017. It showed that 55.9% of respondents believe their views are not being taken into account before important decisions are made. But young people’s influence will only get stronger as they occupy an increasing proportion of the global workforce, voter base and their consumer spending power grows. The results of the survey, compiled by the World Economic Forum’s Global Shapers Community, offer an interesting insight into how young people view the world and its challenges. Governments, businesses and other institutions that ignore the current generation of young people do so at their peril. Here are five things we learned from the survey. You can explore the results in full here. 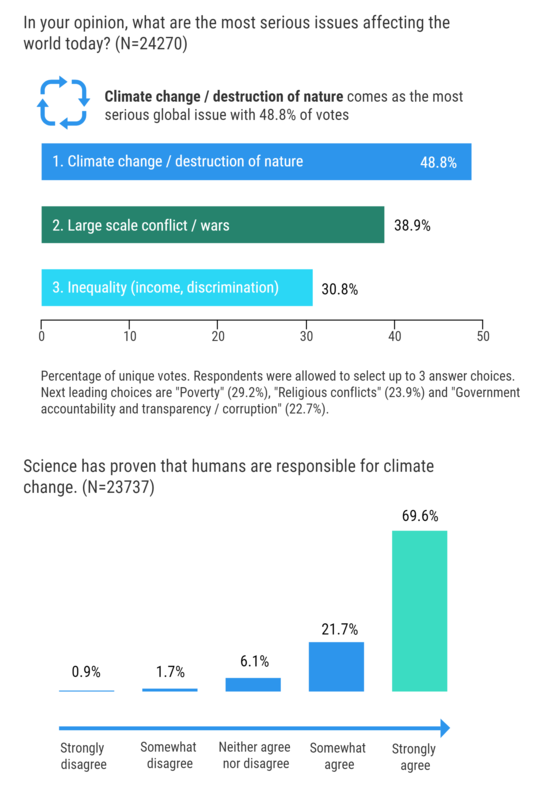 Of all the issues affecting the world today, young people are most concerned about the impact of climate change and the general destruction of nature. This is the third year in a row that climate change has been voted the most serious global issue, suggesting that young people are yet to be convinced by global efforts – such as the Paris Agreement – to tackle the problem. Perhaps unsurprisingly considering the current level of global instability, wars and inequality were listed as the second and third biggest concerns. Poverty, religious conflicts and government accountability and transparency also ranked highly. The rise of fake news during recent elections around the world may go some way towards explaining why distrust for the media is growing among young people. Just over 30% of survey respondents said they trusted the media, compared to almost 46% who said they didn’t. There are similar levels of distrust towards big companies, banks and governments. This reflects the fact that many young people (22.7%) are worried about corruption. The institutions deemed most trustworthy by young people are schools, international organizations, employers and courts of law. There is a common misconception that millennials are workshy. The Global Shapers Annual Survey 2017 shows that young people are, in fact, very career orientated. When asked to name the most important criteria when considering job opportunities, salary came out on top, followed by a sense of purpose and career advancement. Only around 16% said they are willing to sacrifice career and salary to enjoy life. To underline the point that young people are not lazy, the survey found that the vast majority of respondents (81.1%) would be willing to move overseas in order to advance their career. 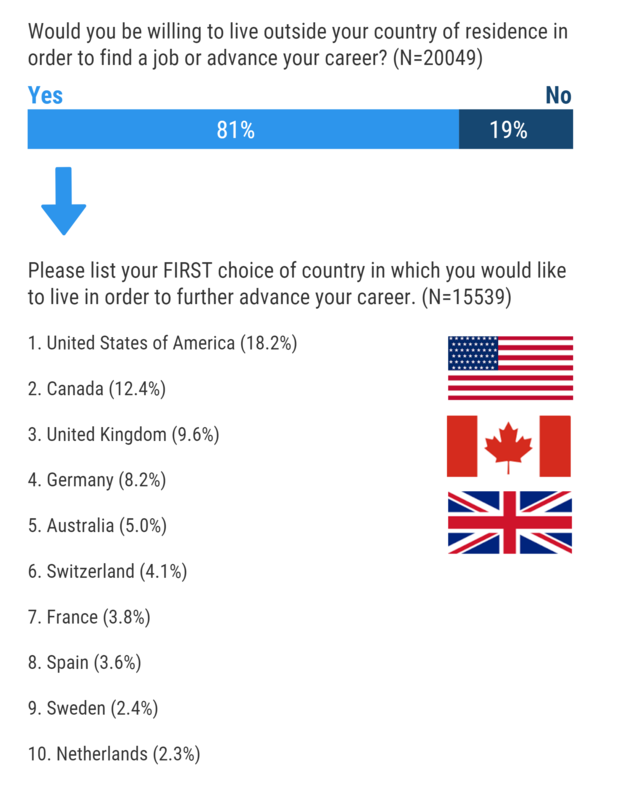 The US, Canada, the UK, Germany and Australia are seen as the most desirable countries to move to for job opportunities. Technological advances in recent years have sparked concerns within wider society that employers will look to swap human workers with robot replacements. However, most young people (78.6%) believe that technology will create jobs rather than destroy them. When asked to name the next big technology trend, 28% of survey respondents said that artificial intelligence will make the most significant impact. Education is seen as the sector most likely to benefit from the adoption of new technologies. Nevertheless, only 3.1% of respondents would trust robots to make decisions on their behalf. When faced with the possibility of embedding an implant under their skin, 44.3% of young people surveyed rejected the idea. This is an empathetic generation, according to this year's survey. 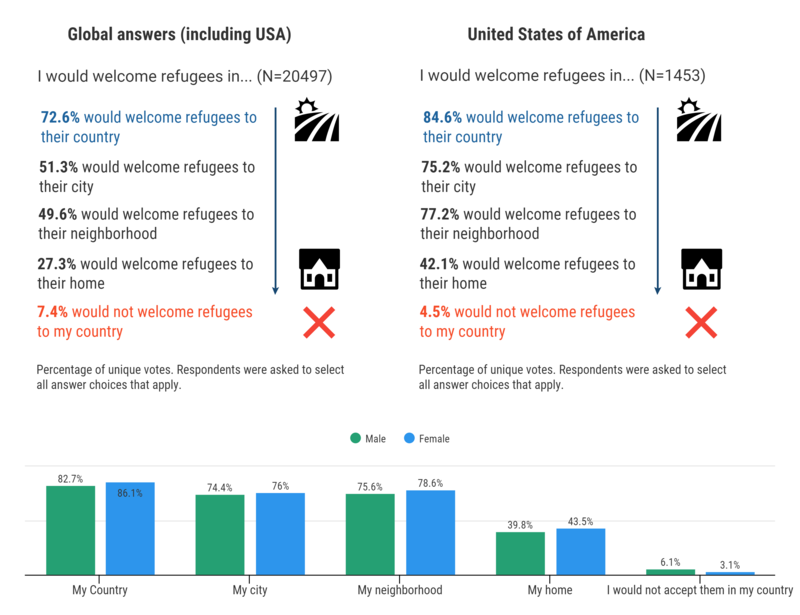 This is perhaps best highlighted by the fact that almost three quarters (73.6%) said they would welcome refugees to their country. When asked how governments should respond to the global refugee crisis, more than half (55.4%) claimed that more should be done to include refugees in the national workforce. Just 3.5% said that refugees should be deported.